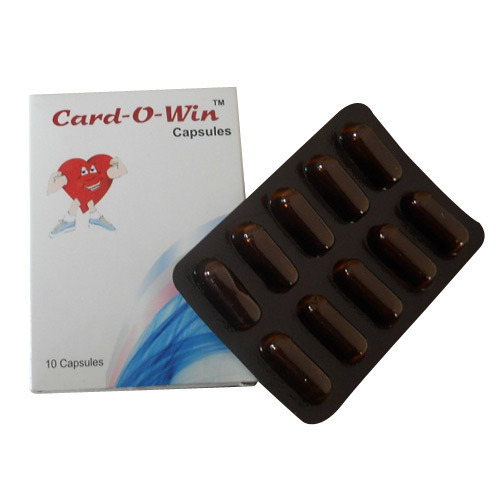 Card-O-win offers the most precious therapy in preventing cardiac dysfunctioning This medicine is a herbal anticoagulant, maintains the status of blood. This preparation is enriched with Arjun Chall that has potential properties of a cardiac tonic. It is a complete medicinal preparation that lowers triglycerides and reduces the process of fat deposits in the arteries. It also maintains the status of lipid profiles that are one of leading parameters of cardiac functioning. We are involved in the manufacturing of a wide range of Herbal and Ayurvedic products, such as Herbal and Ayurvedic medicine formulations, Herbal Health Supplements, Herbal Beauty Products, and Herbal Cosmetics, Keeping in mind the precise necessities of our clients, we offer a wide variety of products in different compositions and utmost quality. We have a wide roomy Infrastructure that has numerous units of Production, Quality Analysis, R & D. We have high-performance production machinery established in 1989 our production unit. Our products go through accurate quality checks sporadically to maintain quality consistently. We have knowledgeable professionals having expertise in processing products as per the needs and requirements of the customers. They have in-depth information of the industry and keep themselves conscious about the changes that happen in the industry in the country and other parts of the globe.To ensure the high shelf life of the products, we pack our products in premium quality packaging materials. In addition, we have established a well-maintained warehousing unit for stocking up our variety of products. Owing to all these factors, we have built a vast customer base in several parts of the Indian Subcontinent and also exploring to other parts of the globe.